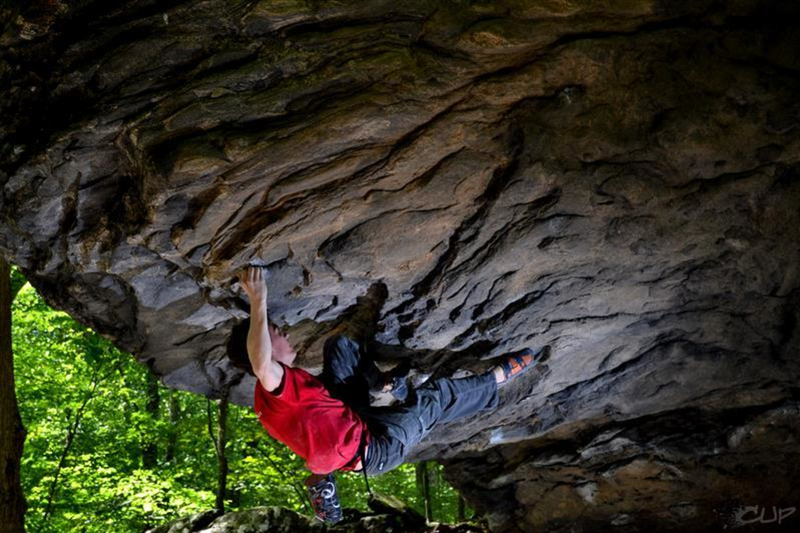 Some of the closest bouldering to Asheville, Corner Rock is a large, overhanging formation with plenty of great problems, and it was even used in the film, The Last of the Mohicans. 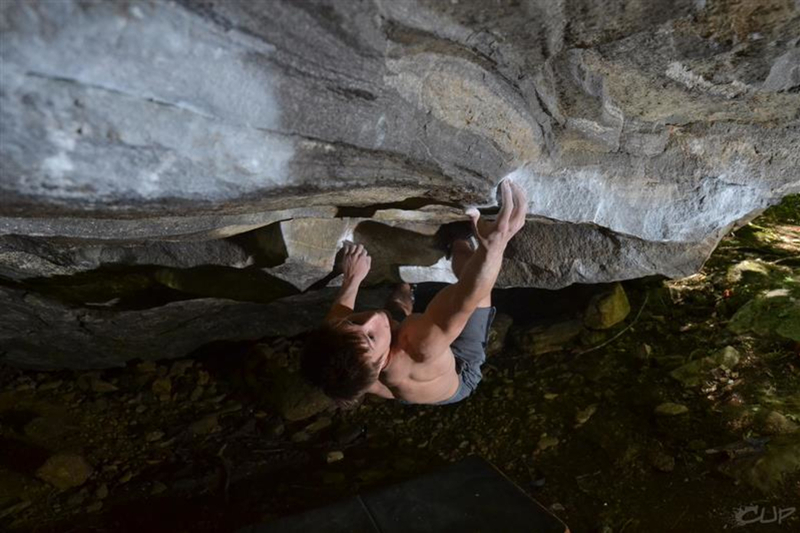 Corner Rock is a bouldering-only venue for intermediate to advanced climbers, with routes ranging from V5 and up. 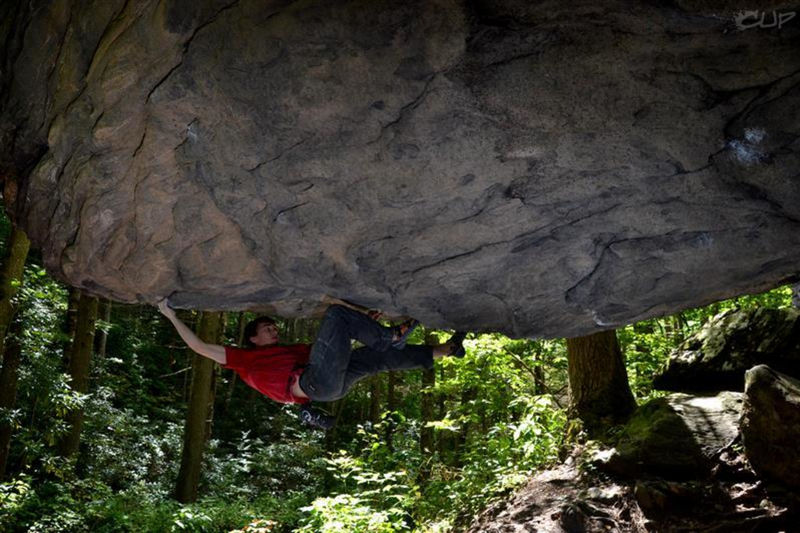 It's small—essentially just one enormous, overhanging boulder stitched with big, pumpy lines—but there are plenty of fun problems that will challenge even experienced climbers. One of the many benefits of Corner Rock is that it's maybe the closest bouldering to Asheville, located in nearby Barnardsville, NC. 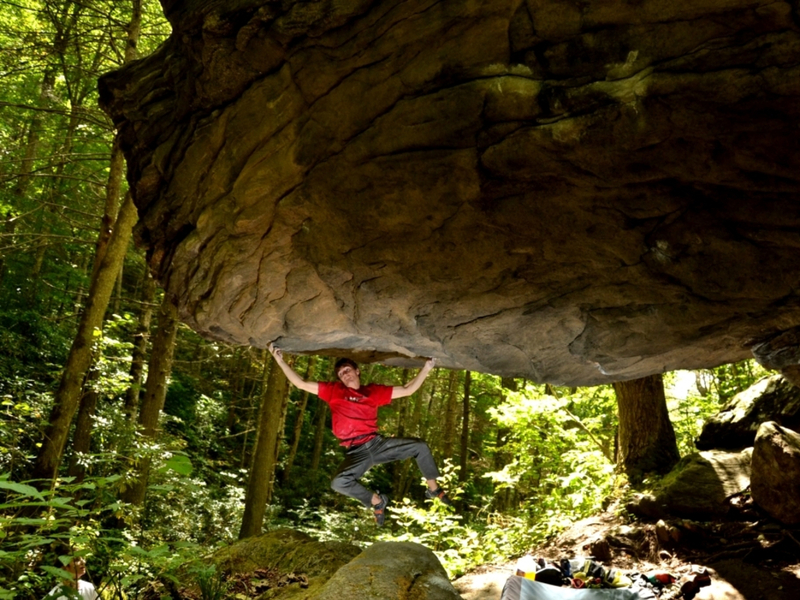 From downtown, you can be there in 20-25 minutes, so if you've only got a few hours, you can get a good bouldering session and great workout. Of interest to movie lovers, it's actually featured in the opening scene of Last of the Mohicans. Named after the villain in that film, "Magua," is a V8 and one of the proudest lines there. 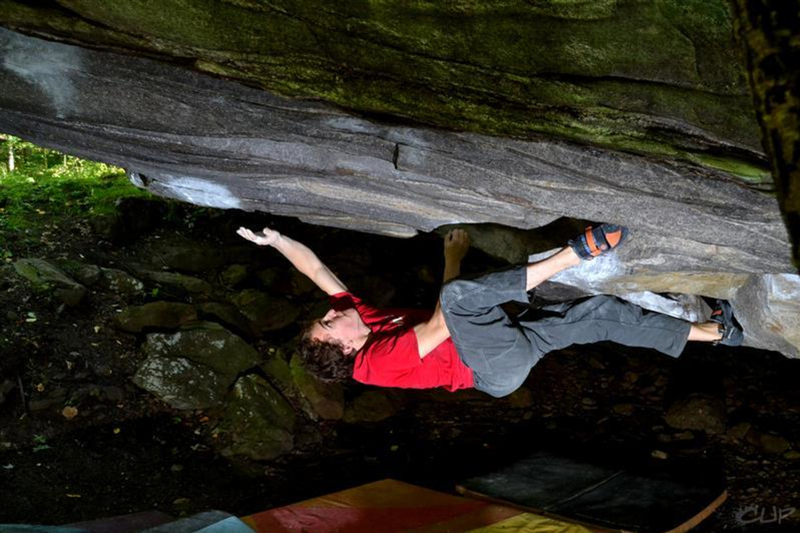 Corner Rock is a giant mushroom-shaped, overhanging boulder with classic problems like "Hatchet," which is a V11 and one of the harder problems in the entire Asheville area. Another added benefit is that there are plenty of creeks in the area, where you can cool off in during the warm summer months. 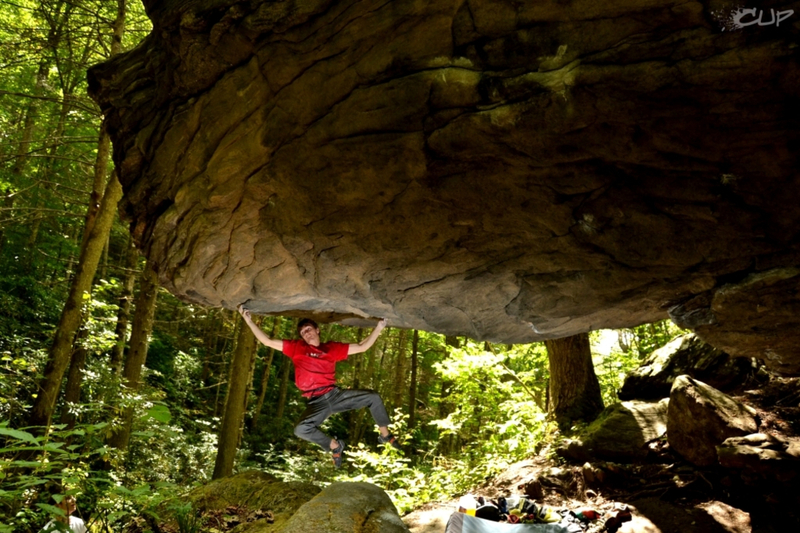 Highly concentrated with a number of fun, diverse problems, the Corner Rock boulder is well-known and loved by Asheville-area climbers. 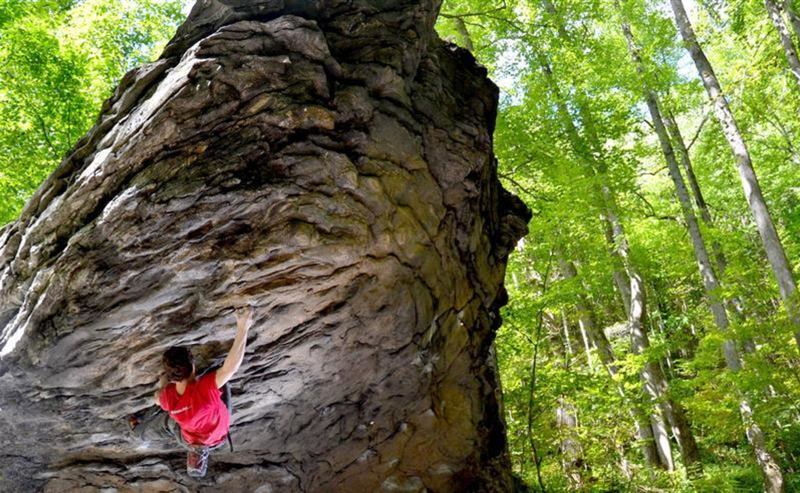 Intermediates and advanced climbers will probably have the most fun on this rock, as most of the climbs on this overhung giant are V5 and up, with the notable exception of a super fun V2 highball. The rangers are nice and friendly. It's in the Big Ivy Section of the Pisgah National Forest near the Coleman Boundary. You can drive and park very close to the rock, and the approach is less than 200 yards, making it perfect for getting out and having a quick burn.